first inning Wednesday in San Diego. Late August, and suddenly the shadows are longer and the light a little thinner. 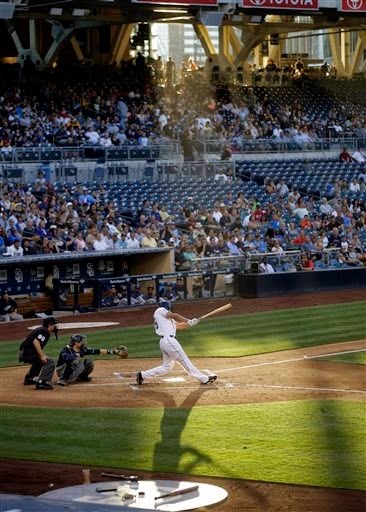 Alex Gordon had himself an impressive series this week against the Twins: A game-winning walk-off homer on Tuesday, a run-into-the-fence catch on Wednesday, a game-tying seventh-inning homer on Thursday. Production and drama make a potent combination. Narrative, for better or worse, tends to drive MVP voting, and the rise of the Royals provides a first-rate narrative. This led the great Joe Posnanski to compose a pair of blog posts -- here and here -- on the topic of Gordon's MVP candidacy. Pos makes a variety of great points, among them mentioning in the first post how some in the sabermetric community see the WAR stat being used (in the great Vin Scully line) as a drunk uses a lamppost (for support rather than illumination). highly rated these days as it once was. But it's the theme of the second post -- that Mike Trout, the best player in baseball the past two years but not recognized by the BBWAA vote as the MVP, is morphing from an incredibly broad talent into something closer to a Miggy Cabrera skill set -- that had me nodding my head in agreement. Trout is an incredible player -- but he doesn't run as well, or at least as often, as he did two years ago, and the defensive metrics aren't as kind to his fielding. This flies in the face of the nearly omnipresent MLB ad that boasts: Mike Trout can do anything. All you have to do is ask. The anything is fading. Bill James wrote decades ago that players who do a lot of things well tend to be underappreciated, and those who do one thing very well tend to get more recognition than they should. Trout in 2012 and 2013 did everything very well. Miguel Cabrera did a few things even better, and got the awards. 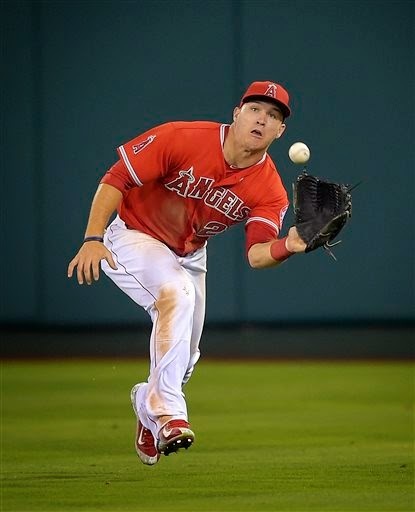 Trout's skill set is narrowing, and now he might finally win the award. There's an irony in that. Tommy Milone, in some ways, was better Thursday night than his line score, which showed him allowing four runs, all earned, in 5.1 innings. And in some ways he was just as ineffective as that line score indicated. Oswaldo Arcia played a leadoff single in the fifth into a leadoff triple. One out later, another single, another run. Take either or both of those runs away, and Milone's line looks better. On the other hand, he faced 26 hitters and gave up nine hits and two walks (.423 on-base percentage), and he didn't strike out a batter. He did throw strikes (55 strikes in 88 pitches) and get ahead of hitters (20 first-pitch strikes), but he had trouble putting hitters away. Milone came to the Twins from Oakland with a reputation as a low-velocity pitcher who kept the ball off the sweet spot of the bat. So far we've only seen the lack of velocity. hitters he faced Wednesday night. Liam Hendriks made 28 starts for the Twins over a three-year stretch before they cut him loose last winter (to make room on the roster for free-agent signee Phil Hughes). None of those starts were as good as his outting Wednesday night for the Royals against the Twins. He took a perfect game into the fifth inning and he didn't allow a run until the seventh. Hendriks didn't get the win, but he was very effective. This gave my (rather Twins-oriented) Twitter feed a theme for the night: How can Liam Freaking Hendriks be shutting out the Twins? Well, there are a number of reasons. Hendriks (and Hughes) benefited from a generous outside corner, for one thing. But another factor in why Hendriks appeared so much better in his Kansas City debut than he ever did with the Twins: The Royals put a high-quality defense in the field behind him. The Twins seldom did. For example: Hendriks' final start for the Twins came on Sept. 16, 2013. He didn't make it out of the first inning: two outs, seven runs allowed. The Twins outfield for that game: Alex Presley in center, flanked by Oswaldo Arcia in left and Chris Herrmann in right. The infield: Chris Parmelee at first, Eduardo Escobar at second, Trevor Plouffe at third, Pedro Florimon at short. Josmil Pinto caught. The defense Kansas City put behind Hendriks Wednesday night was, in my estimation, markedly better at every position except first base and maybe second base. I'm not saying Hendriks was good that night against the White Sox; I will say that defense, and particularly the outfielders, wasn't going to do him any favors -- certainly not of the kind that Alex Gordon did with a catch off Kurt Suzuki. I don't know that Hendriks is going to be an effective major league starter. I do know that his minor league numbers are very good, and I have long believed that the Twins handled him far too impatiently, particularly in 2012. It's taken four years of sporadic starts, but the Rule of 30 finally applies to Hendriks; Wednesday was his 32nd big-league start. The Rule of 30 says you give a pitcher 30 starts before you decide if he can succeed in the majors. Right or wrong, the Twins were never willing to go more than a month with him in the rotation. play a role in that decision. It is a sign of where the Twins are that the most intriguing news of the day Tuesday was the Arizona Fall League assignments. The highlight of that: Byron Buxton, sidelined now by his post collision concussion, is slated to play for the Salt River Rafters. This is seen as an indication that the Twins expect their top prospect to be ready to roll by October, when the prospect-heavy league gets rolling. The Twins don't often have players repeat the AzFL, but all three of the position players on this opening list were there last year: Buxton, Eddie Rosario and Max Kepler. All three have had disappointing seasons, Buxton because of injuries; Rosario with a 50-game suspension and a prolonged behavior-based benching; and Kepler presumably from his rawness. Kepler is currently on the 40-man roster, but the German hasn't had a particularly strong season at high-A Fort Myers (.257/.330/.386), and the Twins may be considering whether they can risk exposing him to the Rule 5 draft. He remains an intriguing athlete and just turned 21, and the always optimistic Seth Stohs says he's been playing better of late. I expect the Twins will keep him on the 40, but this assignment may be an important test for him. Rosario is another matter. He had a real opportunity this year to push his way to the majors, and did nothing with it. He's due to be added to the 40 this winter, and the Twins probably will do so, but they can't be pleased with what they've seen from him. Three pitchers were also assigned to the AzFL: Right-hander Jason Adam (acquired from Kansas City for Josh Willingham) and left-handers Taylor Rogers and Mason Melotakis. All three are currently in Double A.
Adam, shifted this year to the bullpen by Kansas City, is being repositioned by the Twins as a starter, and they presumably want to add innings to his year. Melotakis, a second-round pick in 2012, may be a dark-horse bullpen candidate for 2015; he certainly figures to have a higher ceiling than Caleb Thielbar. Rogers has compiled pretty good numbers as a starter the past two years as he climbed from low A to Double A, albeit without imposing strikeout rates. I'm sure the Twins have a reason to send him to the fall league, but I'm not sure what it is. He doesn't appear to need the innings. at $10 million left on his contract. One of my many pet theories is that the bullpen is a measuring stick for an organization's competency. Relief pitching is both fragile and available. Good organizations, my theory holds, are aware of this and constantly re-evaluate their bullpens and seek to rebuild them on the fly. Top-notch managers are usually adept at identifying the failed starters whose strengths lend themselves to relief work and find the proper matchups. That's the theory, and then there's the Detroit Tigers. The Tigers have dominated the AL Central the past three seasons and remain in the hunt this year, but their bullpens have been more hindrance than help. Given how well general manager Dave Dombrowski has done over the years in other aspects of the roster, that's surprising. Nathan's addition (to a two-year, $20 million deal as a free agent) was supposed to put an end to the late-inning collapses, but the former Twins stopper has had a miserable season. Johnson led the majors in saves in 2012 and 2013 with Baltimore; this year he's been released by Oakland and has an ERA of 7.31. He and the currently DL'd Soira, briefly dubbed the "Mexicutioner" in his glory days with the Royals, were midseason additions. Hanrahan hasn't actually thrown a pitch for the Tigers this year and isn't likely to. All these guys (except Chamberlain and Alburquerque, each 28) are at least 30 years old, and the resulting cluster of aged firemen-turned-arsonists suggests that somebody in the Detroit organization -- perhaps first-year manager Brad Ausmus. perhaps somebody higher in the organization -- is uncomfortable with the idea of identifying the suitable skill set in somebody unproven in the job. Given the World Series-or-bust mindset in Detroit, that's understandable. It's also an expensive mistake. unable to complete five innings on a humid day. A promising season for Kyle Gibson is rapidly decaying. The former first-round pick has been either very good or very bad. Sunday's outing against Detroit -- 4.2 innings, eight hits, four walks, five runs -- fit in the latter category. I thought last season that his call-up was timed for failure; it was his first full season back from his Tommy John surgery and he was hitting the fatigue wall. Gibson worked 51 innings for the Twins and 101.2 for Rochester, a total of 152.2. Sunday's start puts the big right-hander at 144 innings on the season, and it's possible that he's wearing down. Or it's possible that he's just too limited a talent to truly thrive in a major league rotation. What we've seen is a good hard sinker and not much else to get hitters off that pitch. He lacks a swing-and-miss offering -- a consistently sharp breaking ball or a baffling changeup -- so his strikeout rate is subpar, and he doesn't make up for it with stellar control. What he is, is the latest in the Twins line of sinker-slider righties: Joe Mays, Carlos Silva, Nick Blackburn, Mike Pelfrey. These are back-end of the rotation types, inning eaters. You might get a big year out of these guys, but you won't get much more than one. The Twins drafted Gibson with the hope that he'd become a front-of-the-rotation guy. He's 26 now, and ace status is not awaiting him. That doesn't make him release bait -- there are bigger problems in the Minnesota rotation -- but it does make him a mild disappointment. perched in the infield. In a domed stadium. This probably says as much about Tropicana Field, the domed home of the Tampa Bay Rays, as anything. 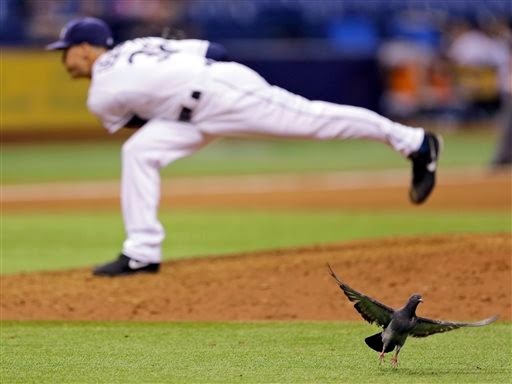 It's indoors, and there are birds on the field. What a dump. The other day I wrote about the Twins' difficulty hitting left-handed pitchers. So Friday night they faced Robbie Ray, left-handed pitcher, and dough-popped him for six runs in the second innings. And in the sixth inning they stung Ian Krol, left-handed pitcher, for five runs (albeit only one earned run). Carping about a game won by 14 runs is a bit unseemly, but I find myself a bit alarmed at the difficulties Tommy Milone is displaying so far. Staked to an early 6-1 lead, he suddenly ceased any semblance of effectiveness in the fifth inning after an Eduardo Escobar error. I really expected better than we've seen so far from Milone. And I was ... bemused, let us say, by the accolades heaped on Escobar for his five-hit game. Let us not forget that he committed two errors and could have been charged with another. It was a rough game in the field for the shortstop, who has generally been pretty solid defensively. Meanwhile, one has to marvel at what has befallen the Tigers. A month ago they figured to cruise to the division title. Now the Royals are 2.5 games ahead, a starting rotation for the ages is decaying, a bullpen stocked with proven closers implodes with regularity and the revamped defense-first infield can't make plays. The minor league season is winding down, and for several of the Twins top prospects, that's probably a good thing. We already know that Byron Buxton won't return to action this month after his frightening outfield collision and concussion. The hope is that he'll pass the concussion protocol to play in the Arizona Fall League. J.O. Berrios and Kohl Stewart, two of the organization's top three starting prospects (the third being Alex Meyer), each missed time at the end of July with shoulder somethings. Yeah, I'm vague. So were the public reports on their issues. Each has returned to action, but not with complete success. Stewart is not yet 20, and he has 87 innings under his belt this season. That doesn't appear to be a particularly heavy workload, but fatigue may still be a factor. Berrios spent last season at Cedar Rapids, also at age 19. He pitched 103 innings for the Kernels and did not appear in their postseason. So even if Stewart is done for the season, he's only 16 innings behind Berrios' workload at the same level. Berrios tonight: 5.2-8-4-3-1-4. Could be "innings-ed out" as Terry Ryan said this week. Berrios is now at 131 innings for the year, and has had to make a midseason transition from the six-man rotation the Twins employ on their A-ball teams to the five-man rotation at Double A. I suspect, however, that between off days and the late July shoulder scare that he's made few if any starts on four days rest. Regardless, Ryan has already declared Berrios off limits for the Arizona Fall League. It's less clear if the Twins will let him pitch winter ball in his native Puerto Rico. Assuming that there are indeed no true injury issues with these two guys, an offseason of rest sounds like a good idea. 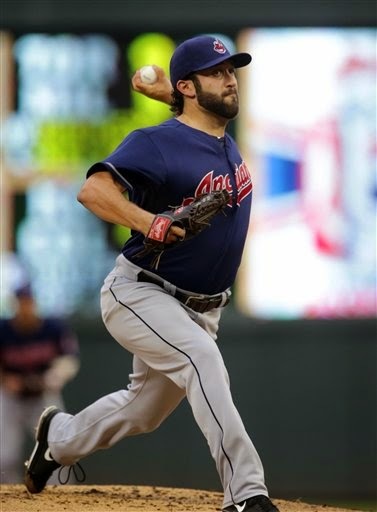 T.J. House, Wednesday's starter for Cleveland, came into Target Field with a 1-3, 4.13 record in 11 starts, with peripheral stats that are similarly blah. Naturally he shut the Twins out. Naturally, I say, because he's left-handed. The Twins hitters have been markedly worse versus left-handed pitchers than against righties: OPS (On-base Plus Slugging) .711 against RHP, .673 against LHP (this entering the Wednesday game). While the Twins' left-handed hitters are displaying a marked platoon disadvantage against left-handed pitchers (OPS down 63 points), so are the right-handed hitters (OPS down 35 points). The platoon advantage is real and universal; that the Twins right-handed hitters, as a group, aren't showing it is odd and not indicative of the future. Brian Dozier for his career (1,515 plate appearances) has an OPS vs. lefties of .829, against righties of .662; there's no real reason for him to suddenly be better this season against righties (.757) than lefties (.714). 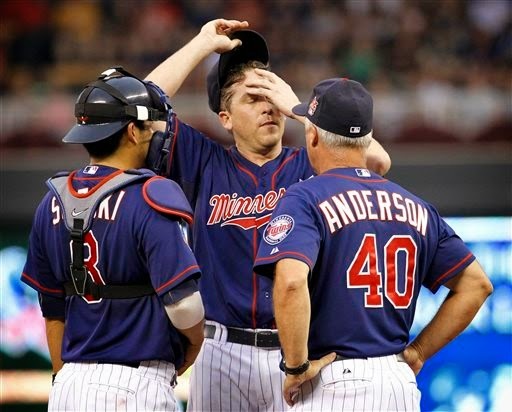 The Twins on Tuesday night, having frittered away a 5-0 lead, came into the bottom of the seventh trailing 7-5. 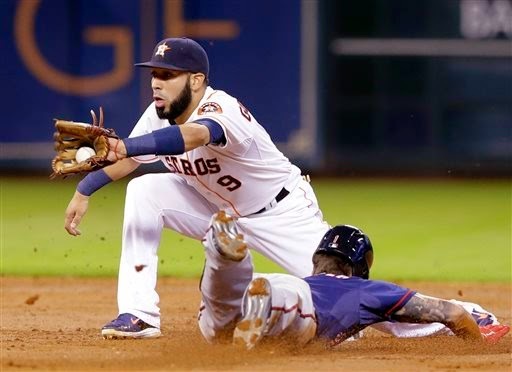 They opened the frame with a pair of infield hits (Eduardo Escobar and Eduardo Nunez). This brought up Danny Santana -- who tried, and failed, to bunt the Eduardos over, then struck out. That was followed by a Brian Dozier popup and a Joe Mauer ground out, inning over. The Santana bunt is a questionable call on Ron Gardenhire's part. I'm not as critical of it as Derek Wetmore is in this piece, but it certainly ought not be viewed by the manager as an "automatic" decision. The percentage-based objection to a bunt in that situation -- runners on second and first, no outs -- is that, as Wetmore details in the linked piece above, it reduces "run expectancy" for that inning from 1.556 runs to 1.447 runs. The thing about run expectancy charts is that the charts don't know who's hitting or pitching. The run expectancy is the same whether it's Pedro Florimon hitting or Mike Trout, the same whether it's David Price pitching or Trevor May. They are an average, a rough guide to the percentages. As a general rule, I dislike the sac bunt when trailing by multiple runs. The Twins in this case needed a big inning, and they only had nine outs left. The counter-argument is: They're at home (play for the tie at home, for the win on the road), and if Santana gets the runners over, they need only one single from Dozier or Mauer to tie the game. And Terry Francona, the Cleveland manager, isn't likely to walk either intentionally, because that would put the go-ahead run on base. So part of the question here is: How good do you really think Santana is? Off his first 272 major league plate appearances, he's hall-of-fame quality, at least for a shortstop. Off his minor league career, not so much. Wetmore takes Santana's numbers so far at face value. I suspect that, for once, Gardenhire has a more realistic view of what his skills are. The rookie's not really a .300-plus hitter. On the other hand, he's facing a truly LOOGY (Marc Rzepczynski) with the platoon advantage. On the whole, I want to go for the big inning there, not play for the tie. But it's not an automatic decision either way, and it ought not be treated as such. his second major league start. Trevor May's second start was a good bit better than his first, which is not to say it was acceptable. The rookie righty opened with four shutout innings, then imploded in a three-run fifth. For the outing, 4.2 innings, seven hits and four walks with just one strikeout. Through two starts and one relief outing since his call-up (nine innings in toto), May has issued 13 bases on balls with just three strikeouts, an absolutely awful ratio. Yes, it was his second straight start against a first-place team. But the Royals, unlike Oakland, are not an offensive juggernaut, and they are (in marked contrast to the Athletics) almost allergic to walks. If the A's were a bad matchup for May, the Royals were a good one. But May found a way to walk four of the 23 men he faced anyway. None of which changes the equation. We may well be seeing why the Twins appeared reluctant to elevate May, but the fact remains that he has more upside than Yohan Pino, Kris Johnson and Logan Darnell, three lesser lights who got big-league opportunities before May did. Pino and May are to start the day-night doubleheader on Saturday versus the Detroit Tigers. (Pino will be the "26th man" for the twin bill.) The expectation is that Pino will return to Triple A and May will stay. Which is as it should be. Kennys Vargas hasn't been in the majors long enough for teams to have reliable hit pattern data, but that hasn't kept them from employing the popular overshifts on him, at least when he's hitting left handed. And Vargas has responded by going the other way a few times for base hits, including an RBI single in the first inning Sunday that gave the Twins a short-lived lead against the Royals. Four of Oswaldo Arcia's last five HRs have come with Twins winning or losing by six runs or more. That trend may be a fluke. Or it may indicate that Arcia is fattening his stats against pitchers who are merely mopping up, as was the case with his home run Sunday that inspired that tweet. Vargas has the more mature approach -- and the one more likely to adjust to given situations and pitchers. And if he continues to get a couple singles to the opposite field each week, it will cut down on the infield shifts -- and provide some of those RBIs. League World Series on Friday. She's only 13, and her pitching at the Little League World Series is catching the attention of some very big names. But the idea that Mo'Ne Davis of Philadelphia is potentially headed for professional baseball -- a notion Keith Olbermann raised on his ESPN show Friday night and that found its way into the AP game story (albeit from a non-baseball person, Pennsylvania Gov. Tom Corbett) -- well, that's a ways too far ahead of the curve to be taken seriously. Yes, she has thrown a 70 mph fast ball, and yes, she's a mere 13. Even if she is in fact the best pitcher in this tournament, she's still some five years away from the professional draft -- and she's a girl. This isn't sexism. It's biology. Her male counterparts are going to get bigger and stronger than she will over the next five years. It's not enough for her to be the best of the best female baseball players; she's got to be one of the best of the best, period. That's a high mountain to climb. Still, this is the second amateur female pitcher of 2014 whose exploits raise that kind of possibility. That's intriguing, to say the least. 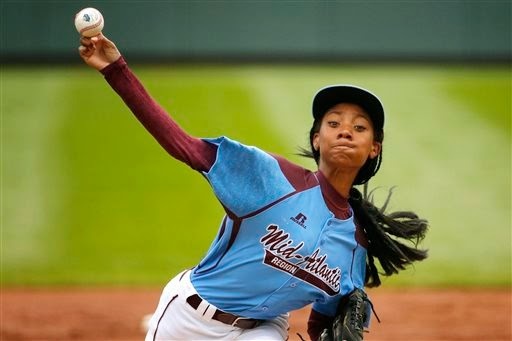 But right now, we should let Mo'Ne Davis be the 13-year-old that she is. Ricky Nolasco's return from the disabled list Friday night was less than a success and not quite a disaster. The veteran went six innings, allowing five runs, all of them in one awful inning. That was enough for Kansas City to prevail 6-5. Another Twins game in which the starter didn't give the team a chance to win. One is tempted to focus on the glass half-full. Nolasco's fastball velocity was back to his accustomed levels. He did have five shutout innings. But his command wasn't great, and the Royals had a number of hard-hit outs. Kansas City is a first-place team, but its record is built on run prevention (pitching and defense); their lineup is not notably potent. The Twins, as weak as they've been at the plate all year, have scored more runs than the Royals. Five runs allowed in six innings isn't good enough against any lineup, much less one as soft as the Royals. Still, we know that a healthy Nolasco is going to be in the Twins rotation, now and into the future. That's what three more years at $12 million-plus a year means. There's time for Nolasco to live up to the expectations of that deal. But right now, as I project a future Twins rotation, he ranks below Phil Hughes, Tommy Milone and Kyle Gibson. And it's conceivable -- maybe even expected -- that Alex Meyer will pass him as early as next season. Conclusion: Nolasco is in the Twins plans. But he ought not be secure in those plans. become the commissioner in January with Selig's retirement. 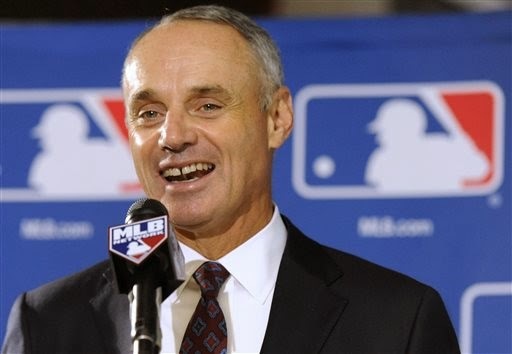 Rob Manfred, Bud Selig's top assistant and labor liaison, is the commissioner-elect. Manfred's highest public profile as Selig's chief operating officer came through his role in the Alex Rodriguez suspension, an accomplishment that certainly didn't cover him with glory in my view. At that, Manfred is almost certainly the best choice of the three finalists, one of whom dropped out before the owners started voting Thursday. That there was a sizable bloc backing Tom Werner, one of the Red Sox ownership troika, should be an embarrassment. Apparently the Werner supporters opposed Manfred because (gasp) Manfred actually cuts deals with the players union. There are owners -- notably Jerry Reinsdorf of the White Sox -- who are unhappy that baseball has had two full decades of labor peace and are itching for a nuclear winter. This is, to be blunt, the dumbest idea in sports management since Gary Bettman. It's hard to believe that Selig, who I used to refer to as "interim commissioner for life," is really leaving the job. I won't miss him. Manfred, I expect, will be Bud 2.0 -- and while I don't particularly like that, I also know that there were worse alternatives. The game was delayed more than a half hour while Buxton was stabilized and loaded onto an ambulance to be taken to the hospital. Right fielder Mike Kavsnicka, a Minnesotan himself (Lakeville and the University of Minnesota), also went to the hospital but was walking. Just had Terry Ryan on air and concussion for Byron Buxton and bruised hip for Kvasnicka. Both will be fine. It's scary stuff for Buxton and the Twins. The kid -- Buxton is 20 -- has had a lost season, and I wouldn't expect him to pop back into the lineup this weekend. six-for-six as a base stealer in seven games with the Twins. Jordan Schafer has been a fixture in the Twins lineup since they landed him on waivers Aug. 3. Part of it, of course, was injury (Oswaldo Arcia missed a few games). Part of it is wanting to see what he's got. And part of it is defense. It's worth remembering that Sam Fuld was playing a lot of corner outfield before the Twins traded him to Oakland. Almost every outstanding Twins team of the Metrodome era had two outfield regulars (and sometimes three) with center field range. Kirby Puckett and Dan Gladden (1987), followed a few years later by Puckett-Gladden-Shane Mack (1991). Torii Hunter and Jacque Jones, at times with Lew Ford. Carlos Gomez and Denard Span. Danny Santana isn't a true center fielder, but Santana and Schafer (or Fuld) do offer the speed to help the strikeout-adverse pitchers. That's not a small thing at all. As for the rest of his game: Schafer appears to rely on his wheels a lot. He's a good, aggressive basestealer, and he is certainly willing to bunt (just not very effective at it). I get the impression that even he doesn't think he can get a hit off a left-hander (.163 career batting average against southpaws), which probably had something to do with the bad on-his-own squeeze attempt on Sunday that wound up getting Eduardo Nunez trapped off third base. We may well continue to see a lot of Schafer in these final weeks of the season, and certainly in August. He's second-year arbitration eligible, and the Twins will want to decide if he's worth the price as a reserve outfielder for 2015. They went through a lot of them this year. Monday's trade of Josh Willingham certainly clarified the likely lineup -- at least until the possibility of September call-ups. Joe Mauer came off the disabled list Monday to claim Willingham's roster spot. He and Kennys Vargas figure to split first base and designated hitter, probably with Mauer getting the bulk of the first-base time. Oswaldo Arcia (current sore back permitting) should be a fixture in right field. Kurt Suzuki and Eric Fryer will handle the catching, Trevor Plouffe third base and Brian Dozier second base. The remaining three positions -- shortstop, center field and left field -- will be divided among Danny Santana (center or short), Eduardo Escobar (short), Chris Parmelee (left) and Jordan Schafer (left or center). This leaves a bench of Eduardo Nunez, whichever catcher isn't starting and whichever of the outfield-shortstop nexus isn't starting. I told Jim Gullickson in my radio appearance earlier Monday that the Twins didn't appear to have the same imperative to move Willingham that they did with Kevin Correia. Correia blocking younger talent in the rotation. Willingham wasn't. If Willingham were playing ahead of a healthy Arcia or Vargas, that would be a problem. It never got to that point, and now it won't. late last month. Neither remains on the Twins. 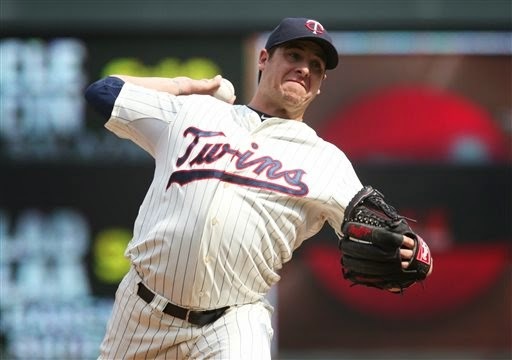 The Twins clearance sale continues, with Josh Willingham dealt Monday to Kansas City. He follows Kendrys Morales, Sam Fuld and Kevin Correia out the door. I am struck by the notion that the best return so far has been for Fuld. The Twins got a established, but not old, major league starter (Tommy Milone) for the career fourth outfielder. Willingham brought a minor league pitcher, Jason Adam. This scouting report on Adam says he has a decent fast ball and slider, but struggles with his curve and change. The Royals had moved him to the bullpen, and he was doing well in Triple A after struggling at Double A for a year and a half as a starter. So naturally the Twins are sending him back to Double A to be a starter. I speak sarcastically, but there is method to this madness. Starters are more valuable than relievers, and maybe somebody in the Twins operation thinks they can get him the offspeed pitch he needs to be a starter. Baseball America rated Adam the ninth best prospect in the Kansas City system during the past offseason. I rather doubt he'll be in the Twins top 20 this winter. So he's a lottery ticket. That's fine. Willingham's contract runs out at the end of the year, and I don't imagine the Twins will strive to bring him back. He's 35 and over the past two seasons he's hit .209 with a slugging percentage of .380. Getting somebody with a chance to be something for seven weeks of Willingham is a good move. The Royals are emphatically in go-for-it mode, and they should be. They moved ahead of the Tigers in the standings Monday night. Anibel Sanchez is already on the disabled list, and Justin Verlander left his start Monday after two innings with shoulder problems. 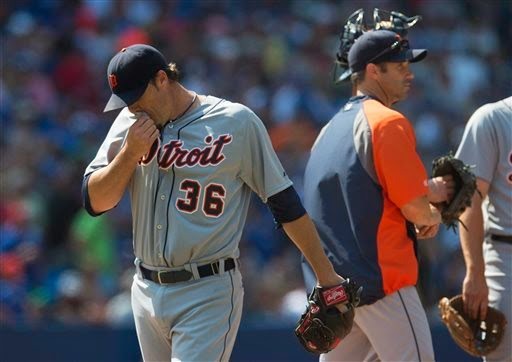 Suddenly the vaunted Detroit rotation doesn't look so darn imposing. 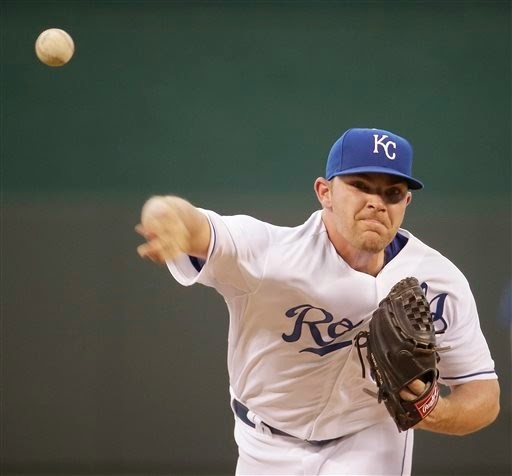 It's a good bet that Willingham will be limited to DHing with the Royals. 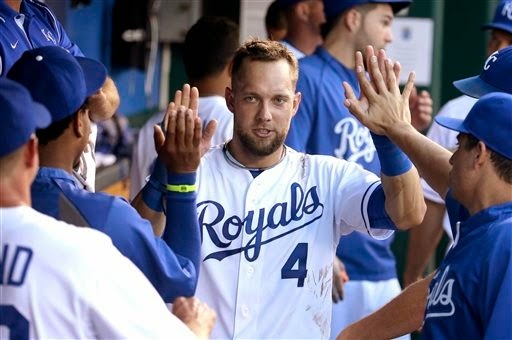 Alex Gordon, the KC left fielder, is their best player; Willingham isn't moving him aside. The Royals' regular DH, Billy Butler, might wind up playing a lot of first base now than Eric Hosmer is sidelined. So there's a place for the Hammer. Beterr than in real life: My biweekly KMSU appearance talking Twins with Jim Gullickson. We recorded this one in advance, and he had the opportunity to edit out a question/answer that didn't make sense. Which might be the case for a lot of what I say. A week ago in the print column, I called for Kevin Correia to be moved off the Twins roster to make room for pitchers who figure to be of use in 2015. And on Sunday, the veteran right-hander was sent to the Los Angeles Dodgers for the always-in-demand player to be named later. We don't know who the PTNL is, and as far as I'm concerned, it doesn't much matter. Correia's roster spot is more valuable. 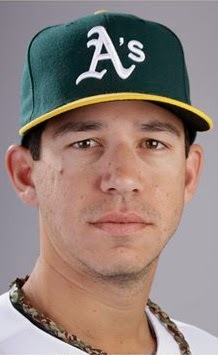 When him gone, Tommy Milone is called up for tonight's start. Milone is better than Correia, and he figures to be around for a few years. Another move is coming today when Joe Mauer (remember him?) is activated from the disabled list. My guess is that Oswaldo Arcia will go on the disabled list; he's missed the last two games with a sore back, and the word Sunday was that it hadn't improved from Saturday. Yet another rotation move is likely this week with Ricky Nolasco, who went 5.2 innings in Cedar Rapids on Sunday in the final game of what the Kernels were billing as the "Rehab Homestand." Presumably he'll dislodge Yohan Pino from the rotation, although not necessarily from the roster. I wouldn't stunned if the roster spot came from a bullpen arm, with Pino moving to a relief role. The Twins project to have a September rotation of, in some order, Phil Hughes, Kyle Gibson, Milone, Nolasco and Trevor May. That's not a bunch of Cy Young candidates, but it's better than the September rotations we've seen the past few years. And it might be the rotation next April as well. 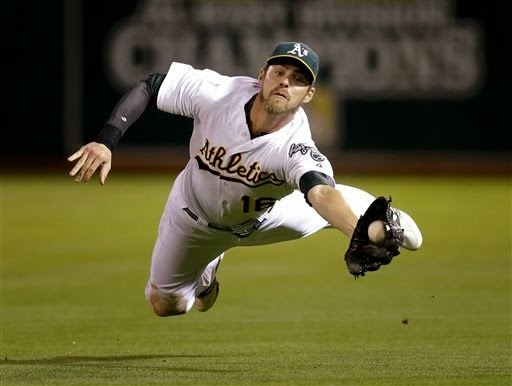 Josh Reddick makes a diving catch, right? Evan Longoria got a single on Tuesday. No commentary to make on this one. I like the moment -- the ball apparently settling into the glove, Reddick's eyes following it in -- and I have a hard time believing he didn't make this catch. Trevor May will make his major league debut today for the Twins at Oakland. To which I say: It's about blinkin' time. I'm fairly certain that the righty would have been up about a month ago had he not popped a calf muscle in late June, shortly after being named to the USA team for the Futures Game. He missed several weeks, then had a lengthy "rebuild the arm strength" series of starts marred by rain delays. And now May gets the Oakland Athletics for his first big league start. Well, it will only get easier from there. It's a challenging opponent for May not merely because Oakland is one of the best teams in baseball. It's how Oakland is one of the best teams. The A's lead all of baseball in walks drawn. May's greatest weakness on the mound is his control. He's thrown more strikes this year than in the past, but his walk rate in Triple A isn't up to the Twins usual standard. It's easy to imagine him walking the ball park today. May has never pitched in a league with an Oakland affiliate. He's split his minor league tenure between the Phillies and the Twins systems, and the only overlap either system has with Oakland's is the Twins in the low A Midwest League. But May did his low A time in the South Atlantic League with the Phillies. So the A's knowledge of May is less than ideal, and that might help him get through a few innings while the hitters find out what he's got. He'd better throw it for strikes, though. Tommy Milone was acquired by the Twins more than a week ago and was assigned to Rochester. He started Tuesday there (seven innings, one run allowed, took the loss) and remains in Triple A.
Phil Mackey figures that by leaving Milone stashed in the minors another week, the Twins insured that he'll be under team control (ineligible for free agency) an additional year. That, Mackey says, excuses the delay in installing him in the major league rotation (and, by extension, messing around with the likes of Logan Darnell and Yohan Pino in the rotation instead). I'm not so sure. Milone is unlikely to ever be of more value to the Twins as a pitcher (as opposed to his value as trade bait) than he is right now. By the time that extra year rolls around, Milone might be more rotation hindrance than help. That's an assessment that assumes that the Twins by then will have a rotation of Kohl Stewart, Alex Meyer, Jose Berrios, Kyle Gibson and Lewis Thorpe. 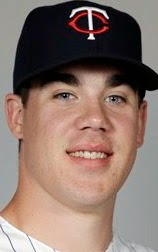 Or Trevor May. Or Ricky Nolasco at the end of his contract. Or Chih Wei Hu. Or Stephen Gonsalves. Or any of a number of current minor leaguers who have higher ceilings than Milone. I'm not denigrating Milone. He's a capable mid- to-back-of-rotation starter right now, and the Twins have a current shortage of that. But that's the most he's going to be. Playing roster games to milk an extra arbitration year out of him doesn't make a lot of sense. He should be on the major league roster now. Play it straight and let the 2018 rotation take care of itself. I posted the other day about the imposing stat line being put up at Cedar Rapids by Hu. Naturally he immediately proceeded to have his worst start as a Kernel (four innings, six runs, all earned). And now Hu is no longer undefeated. Anthony Swarzak pitches in the 10th inning Wednesday. and took his first loss of the year. Anthony Swarzak got the call for the 10th inning of a tied game Wednesday afternoon. He gave up a home run, and the Twins lost. It fits a multi-year pattern for Swarzak. Bring him into a game that's been decided, and he pitches well. Use him in a winnable game, he fares ill.
That the 2004 second-round draft pick has fared better as a reliever than as a starter over the years is no secret. For his career, Swarzak has a 5.66 ERA in 29 starts, a 3.72 ERA in his 136 relief outings. But Swarzak's problems in close, winnable relief outings is almost as strong. Baseball Reference splits relief outings into three categories: High Leverage, Medium Leverage and Low Leverage, based on win expectancy. For his career, Swarzak has allowed a slash line of .320/.368/.487 in high leverage situations, .282/.338/.429 in medium leverage situations, and .262/.309/.401 in low leverage situations. Swarzak's splits for this year: .333/.467/.667 in high leverage, .349/.391./465 medium, .232/.269/.318 low. He has faced 31 batters in high leverage situations and walked six of them; he has faced 160 in low leverage situations and walked eight of them. There are two alternative interpretations available. One is that this pattern is a fluke -- a multi-year fluke. It's possible. Even his career splits involve less than 230 batters in high leverage situations. The other is that there is a legitimate difference in his abilities in tight situations. Perhaps the moment gets to him, the adrenaline rush is too much, and he grips the ball too tightly or something of that nature. Wednesday wasn't a save situation, but it was an important situation -- tied in extra innings is high leverage indeed. And, once again, Swarzak didn't get it done. best breaking ball in the International League. Every year Baseball America runs a "Best Tools" feature. There are some interesting things about the Twins and their system in this year's model. Notable from the major league listing is the lack of Twins. For the big leagues lists (one for each league), the magazine polls the major league managers and lists a top three for each tool. The only Twin listed is Phil Hughes, third for best control in the American League. For all the bragging locally about Brian Dozier's defense, he wasn't listed among the top three defensive second basemen (Dustin Pedroia, Robinson Cano and Ian Kinsler were 1-2-3). And, no real surprise, Joe Mauer, traditionally listed in the strike-zone judgment category, is absent this year. Things are a good bit better in the full-season minor league rankings, even with Bryon Buxton and Miguel Sano unlisted. For the minors, BA lists just the first place winner. Eastern League (Double A): New Britain was shut out. Midwest League (low A): Kohl Stewart, best pitching prospect. Nick Burdi, best fastball. Much of these rankings are no real surprise. The one that jumped out at me was Polanco being deemed the best defensive shortstop in the FSL. He certainly struggled with the position early in the season. This suggests that the attempt to groom him as a shortstop may be successful. The news that Joe Mauer and Ricky Nolasco are going on rehab assignments this week in Cedar Rapids prompted a few minutes thought of darting down to take in some games in CR. That notion didn't take hold, but I did take a peek at how the Kernels have fared since my trip there last month. The Kernels were, when I arrived, playing poorly; they were near the bottom of the second-half standings, and they lost the first game I saw. And then they started winning. It's purely coincidence that their hot streak started while I was there, of course. And the Kernels are now in second place in the division (second half standings), just a half game out of first. (Overall, they're still below .500 for the season, but not by much). A lot of players had something to do with that streak, but as I reviewed some of the stats my eye was caught by Chih-Wei Hu, the 20-year-old Taiwanese pitcher I saw in the second game of my visit. That game was his first start in the Midwest League, and he got a no-decision. He's had four starts since then, gone six innings in each (as he did in that debut), and gotten the win in each. He's 4-0, 1.50, with just 18 hits allowed in 30 innings and a very nice 29 strikeouts to just six walks. He has yet to allow a home run. I may be overly impatient, but it doesn't look from those numbers as if Midwest League hitters are presenting much of a challenge for Hu. Hu has yet to take a loss in pro ball. He was 2-0 last year with the Gulf Coast Twins in the lowest level of U.S. minor leagues, 1-0 with Elizabethton this year before being promoted to Cedar Rapids, and now 4-0 with the Kernels. Hu doesn't have great velocity, but I heard Brad Steil, the Twins director of minor league operations, on the radio cite his movement and his curve ball and note that he has two changeups. This intrigues me; a lot of pitchers struggle to master one change of pace, and Hu has two different ones. This, for me, is one of the fun aspects of parachuting into a minor league city and taking in a few games. Hu is not a hyped prospect; as I noted last month, at least seven pitchers on the Cedar Rapids roster got bigger bonuses than he did. But he caught my attention, and if he keeps getting the outs, he'll start getting some attention. The Twins have had quite the parade of "fourth outfielders" this year. They waived Alex Presley coming out of spring training; he was grabbed by Houston. They had the brief Jason Bartlett delusion; that ended with his retirement. They brought up Darin Mastroianni for 11 at-bats and then waived him; Toronto grabbed him. They claimed Sam Fuld off waivers from Oakland, and that settled things until Oakland decided they needed him after all, and the Twins traded him back for a starting pitcher. Which left the Twins without the traditional fourth outfielder, defined as a bench guy, often left-handed or a switch hitter, who can play center field. Fourth outfielders are generally legs and a glove; if they were truly quality hitters, they'd be regulars. That's a good description of Fuld; while he had a strong stat line with the Twins (on base percentage .370), his career OPS+ is 85, meaning that he's 15 percent below league as a hitter. 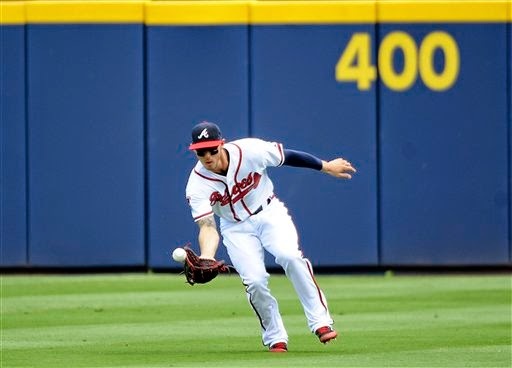 On Sunday the Twins announced that they had landed Jordan Schafer on waivers from Atlanta. Schafer is a former third-round draft pick who has split his five-year major league career between Atlanta and Houston. He's five years younger than Fuld (27) and an even weaker hitter (OPS+ for his career 68). He's fast (88 career steals and just 22 caught stealings), but the defensive metrics aren't particularly high on his defense. Schafer is not as good a fourth outfielder as Fuld, but the move down in the role for the Twins makes sense to get the rotation upgrade -- assuming, of course, that they take advantage of the rotation upgrade by actually activating Tommy Milone, something they have yet to do. The Twins haven't announced a move to get him on the 25-man roster (they had an opening on the 40 man roster created when they DFA'd Matt Guerrier). With today's off day, they can wait until Tuesday to make their move. My guess: Chris Colabello goes back to Rochester. I assume the Twins want to take a sincere look at Kennys Vargas, and Colabello hasn't done much since coming back up. from New York on Thursday. Let there be no mistake about it: Replay review is just as imperfect as the human calls on the field. Particularly irritating are the correct calls reversed in New York, as was the case in the eighth inning Thursday in the Cincinnati-Miami game. A Reds runner was thrown out by 20 feet to end the inning but New York ruled him safe on the dubious grounds that the Marlins catcher had illegally blocked the plate. That call tied the game. The Reds then scored two more runs and won 3-1. MLB issued a nonsense statement the next day defending the reversal as a judgment call. The judgment was on the field. The reversal was an overly literal reading of the rule. There was never any chance of a collision until well after catcher John Mathis had the ball. 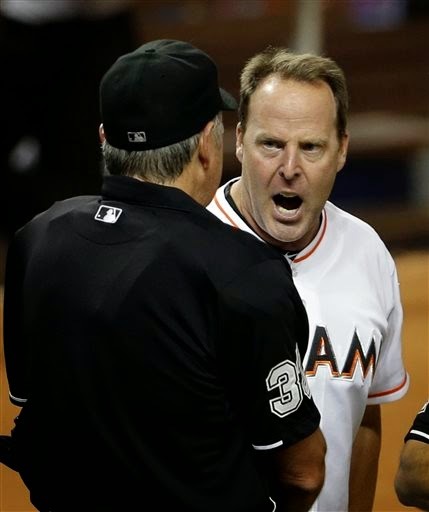 According to Peter Gammons, the entire Marlins dugout heard umpire Mike Winters pleading with New York not to reverse the call. The umpires rotate through the New York replay center, and I'm really curious who it was that screwed up this call. There's been a few of them, perhaps most notably a call that suggested that catchers cannot be on home plate when trying for a force out at home. That one got a quick admission from the higher-ups that the replay officials erred. There was no such admission on Thursday's call. But there should have been. He didn't get much help from the fielders, but Logan Darnell wasn't good Friday night in his second major league start. The lefty wasn't good in his first start either. The Twins have given 25 starts so far to Darnell, Mike Pelfrey, Sam Deduno, Yohan Pino, Kris Johnson and Anthony Swarzak, none of whom seem likely to ever decorate the rotation of a contender. Meanwhile Trevor May, Alex Meyer and now Tommy Milone (who has twice been a rotation regular for a division champ and is 27) fill their Triple A rotation. There have been reasons for this, but it is aggravating to see opportunities directed to low-ceiling guys like Pino and Darnell instead of the pitchers who might actually matter. Milone started two days before the trade, so his presence on the Rochester roster at this moment doesn't matter, but there is no good reason to have him actually pitch for the Red Wings while Darnell and Pino start in the majors. Yet that is apparently the plan. The failure/inability to prune Kevin Correia from the roster at the trading deadline keeps a rotation spot filled with deadwood. 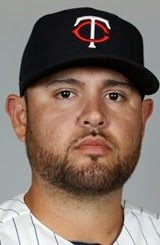 Ricky Nolasco is to begin a rehab assignment next week (he and Joe Mauer will both be with the Cedar Rapids Kernels by Tuesday), and once he's ready to go, he'll certainly be in the rotation. There's too much invested in him. This team with a miserable rotation is pretending that there's no room for the kids. And it's not going to get better. Nolasco. He has three more years on his contract. Phil Hughes. No argument there. Kyle Gibson. He's been inconsistent, but by some measures he's been more effective than Hughes. Milone. Not a Cy Young candidate, but he has 2.5 years in the Oakland rotation without jeopardizing their status. Pelfrey, with one year and $5.5 million left on his contract. As matters stand, they don't even need the low-upside fillers (Johnson, Pino, Darnell) to block the high-end prospects next spring. Yikes. The Twins did indeed make a deal on deadline day. One trade, and it looks pretty darn good from here: Sam Fuld back to Oakland for Tommy Milone. They had other moves to make as well: they called up Kennys Vargas and signed Kurt Suzuki to a two- or three-year contract extension, depending on how many at-bats the veteran catcher gets in 2016. A soft-tossing 27-year-old lefty, Milone has compiled a 32-22, 3.84 record in 80 games, 78 starts over the past four years. Yes, he's in Triple A now; that's because the A's overloaded themselves with starters earlier in July with the Jeff Samardzija-Jason Hammel trade, and Milone had an option left. The Twins have been trying to add velocity in recent years. That is, emphatically, not Milone; he averages 86 mph on his fast ball. But he's been effective anyway. Will that effectiveness continue? Well, he won't have the outfield defense behind him with the Twins that he generally had in Oakland, but Target Field, like the Oakland monstrosity, is pitcher-friendly. He's not close to be being the best lefty dealt on Thursday, and he's nobody's idea of an ace, but he will be an upgrade in the middle to back of the rotation. His track record says he's better than Kevin Correia. Milone had dropped to seventh on the A's starting pitcher list with the addition earlier Thursday of Jon Lester, and he was vocally displeased about his demotion. For now, he's assigned to Rochester, but I rather suspect the Twins won't even have him report to the Red Wings. He started Tuesday for Sacramento; I expect him to be called up this weekend. I opined in the Monday print column that a big reason -- really the only reason -- for the Twins to retain Suzuki was the lack of alternatives in the system. The veteran got two years guaranteed at $6 million a year -- more than double his current salary -- and a third year at the same pay if he meets playing time criteria. What this tells us, besides the fact that Suzuki has had a surprisingly good season with the Twins, is that the organization doesn't believe in Josmil Pinto in particular or in any of the catchers in the upper levels of the farm system. That last is no surprise -- it's why the Twins drafted three catchers in the first nine rounds of the 2013 draft. Everybody is falling over themselves lauding Billy Beane, the Oakland GM, for landing Jon Lester on Thursday. His moves with Fuld, on the other hand, don't look quite as nifty. Fuld opened the season with the A's; he played centerfield against the Twins during Minnesota's home opener series because of injuries to Coco Crisp and Craig Gentry. When Crisp and Gentry were ready to play, Beane waived Fuld, and the Twins picked him up. And now Crisp and Gentry are hurt again, and the A's plan to fill left field after trading away Yoenis Cespedes doesn't involve defensive whizzes, and Beane needed somebody who can handle center field and come off the bench to catch a fly ball in left. So he surrendered a legitimate major league starter (Milone) to get Fuld back after giving him away. The Twins called Vargas up from Double A to fill Fuld's roster spot. They are not comparable talents; Fuld is a 32-year-old speedy slap-hitting outfielder, Vargas a lumbering 23-year-old DH-first baseman with bigtime power. Vargas' solid numbers at new Britain were fueled by a monster month of May; he endured a stiff slump in July. I doubt he's going to shine in this trial. But I have no problem with letting him try. The at-bats he gets will be taken from the likes of Chris Collabello, Chris Parmelee and Josh Willingham, none of whom are prominent in the Twins future plans. Vargas might be.